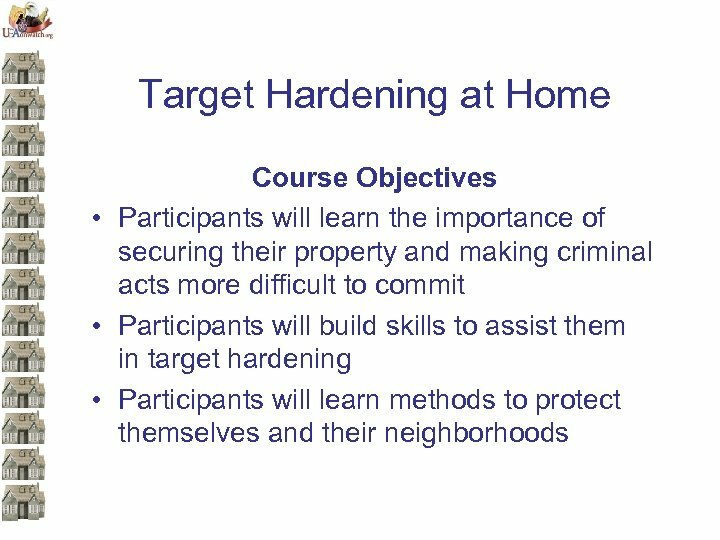 Target Hardening at Home • Burglary is a crime of opportunity. 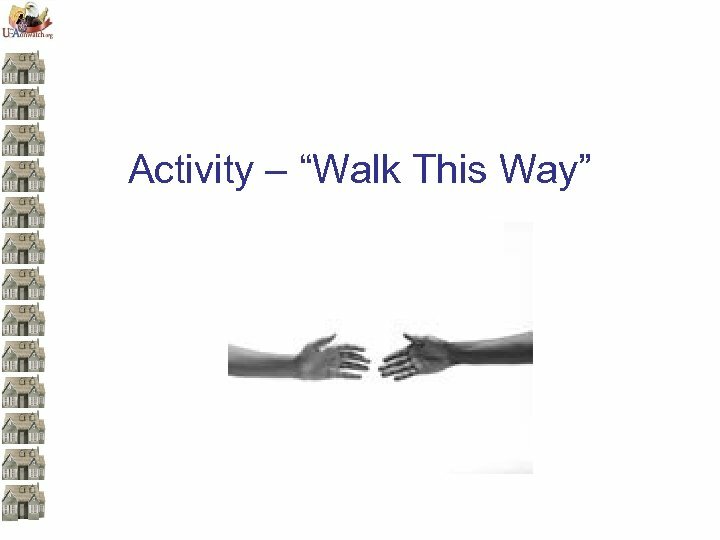 The more obstacles that are in the way, the less likely that the crime will occur. 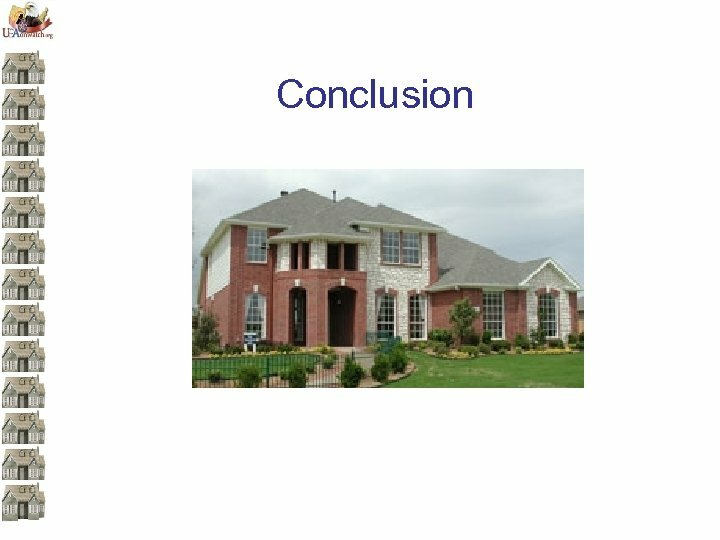 • The homeowner must keep in mind that each house design is different and requires a different approach. 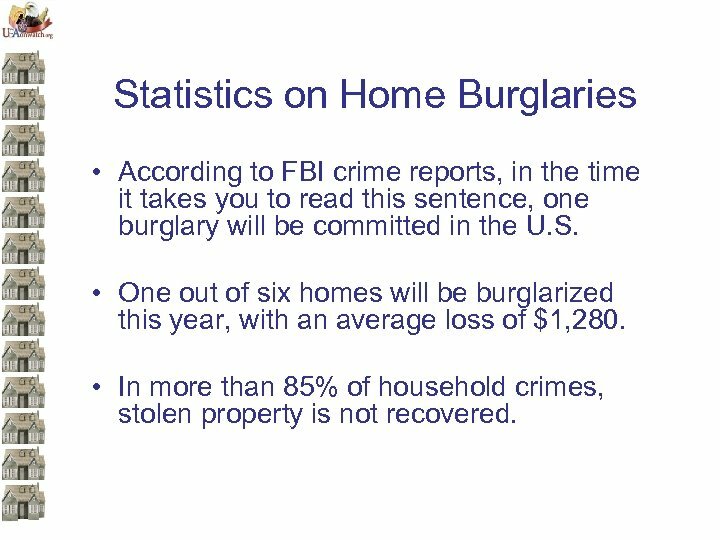 Statistics on Home Burglaries • According to FBI crime reports, in the time it takes you to read this sentence, one burglary will be committed in the U. S. • One out of six homes will be burglarized this year, with an average loss of $1, 280. 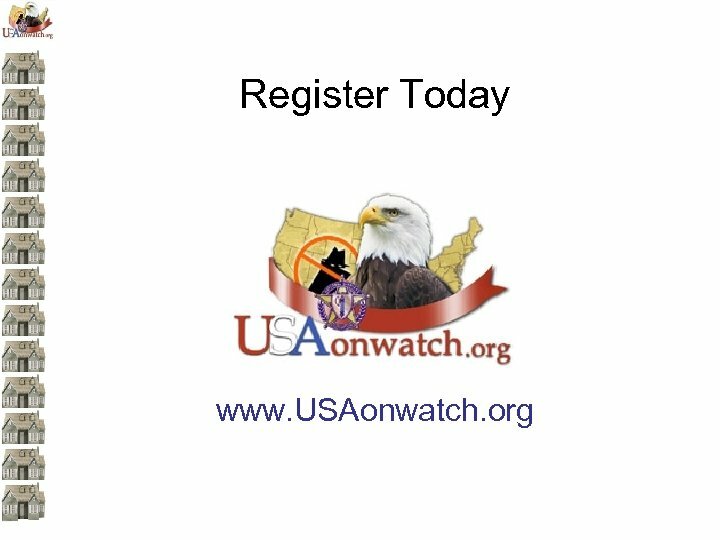 • In more than 85% of household crimes, stolen property is not recovered. 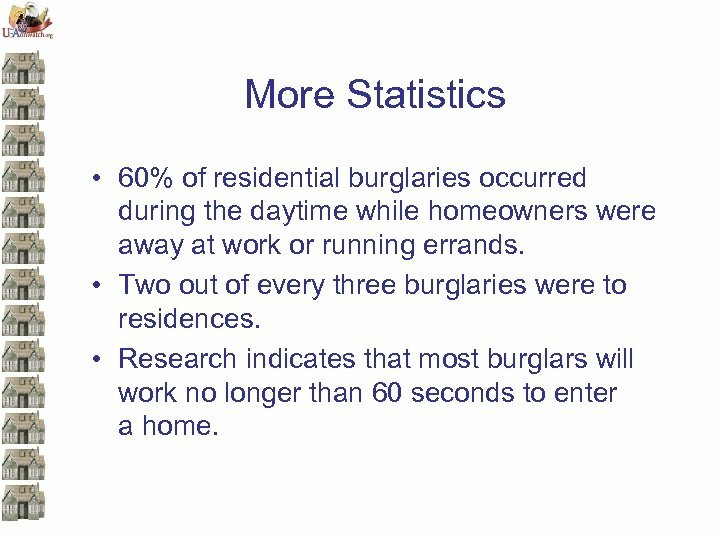 More Statistics • 60% of residential burglaries occurred during the daytime while homeowners were away at work or running errands. 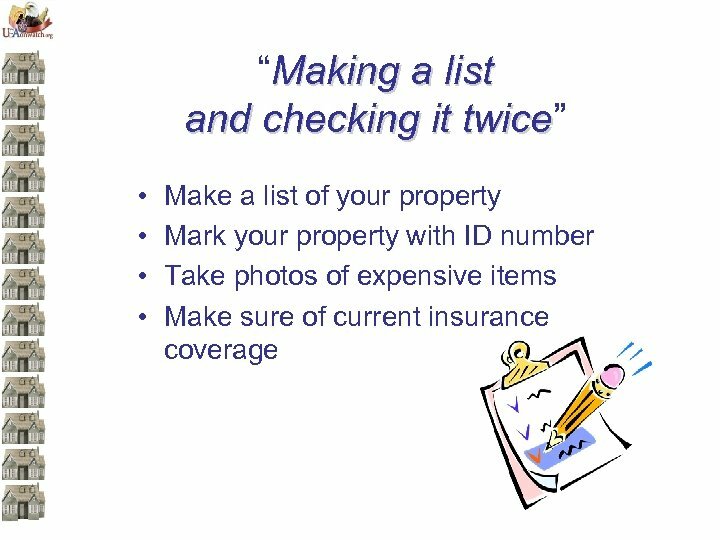 • Two out of every three burglaries were to residences. 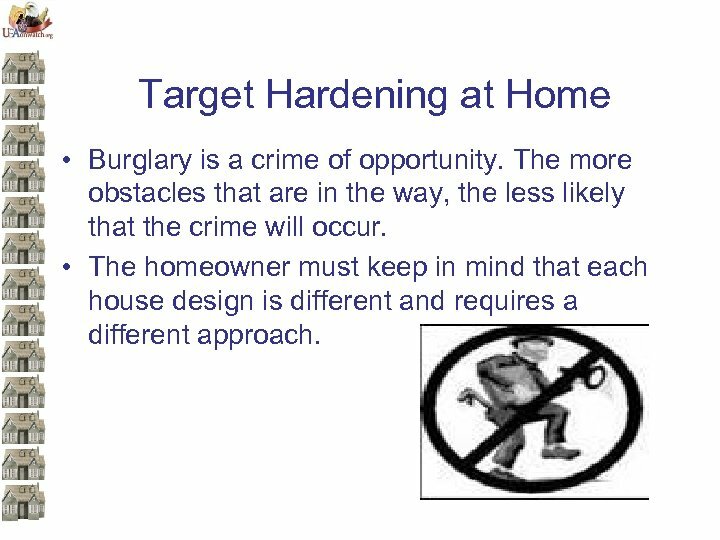 • Research indicates that most burglars will work no longer than 60 seconds to enter a home. 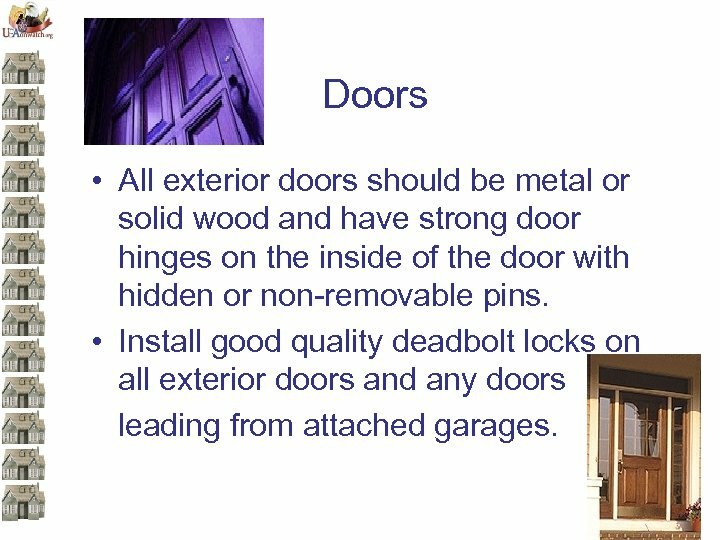 Doors • All exterior doors should be metal or solid wood and have strong door hinges on the inside of the door with hidden or non-removable pins. 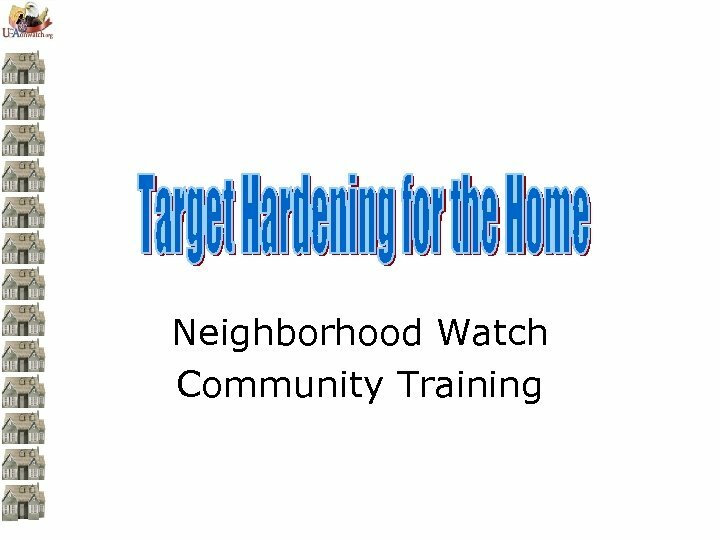 • Install good quality deadbolt locks on all exterior doors and any doors leading from attached garages. 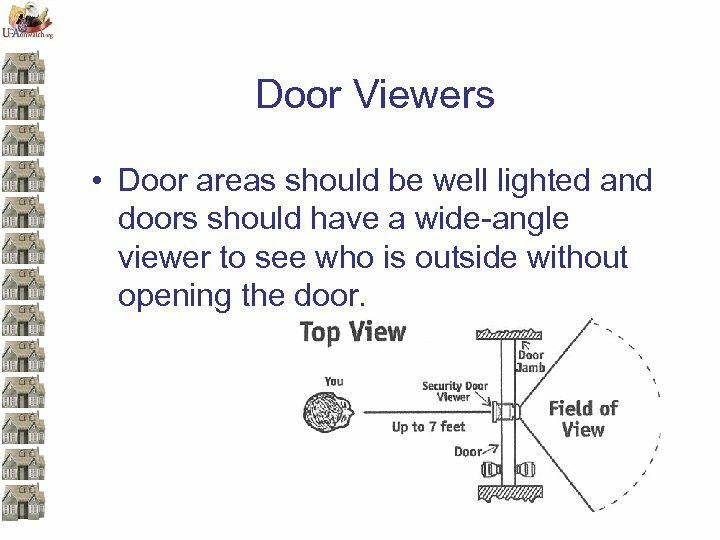 Door Viewers • Door areas should be well lighted and doors should have a wide-angle viewer to see who is outside without opening the door. 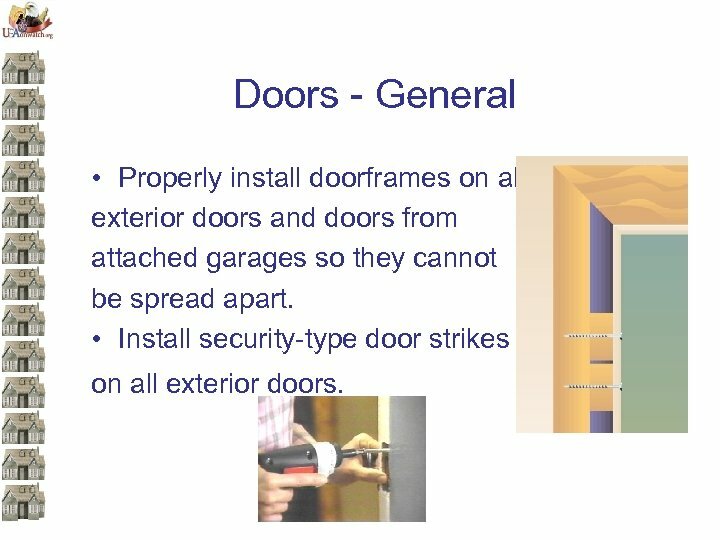 Doors - General • Properly install doorframes on all exterior doors and doors from attached garages so they cannot be spread apart. 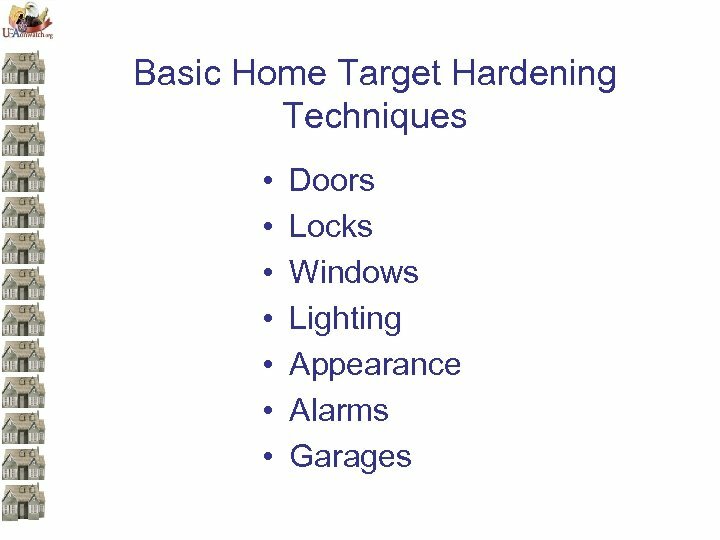 • Install security-type door strikes on all exterior doors. 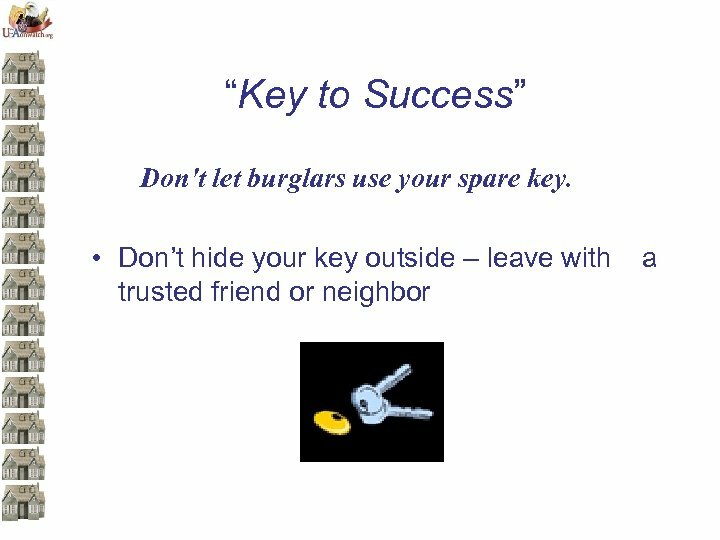 Locks • Install strong, reliable deadbolt locks that extend at least one inch when in the locked position. 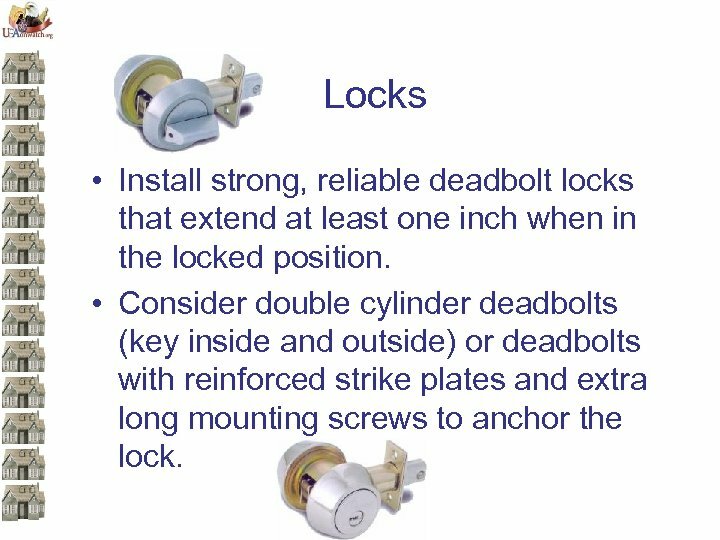 • Consider double cylinder deadbolts (key inside and outside) or deadbolts with reinforced strike plates and extra long mounting screws to anchor the lock. 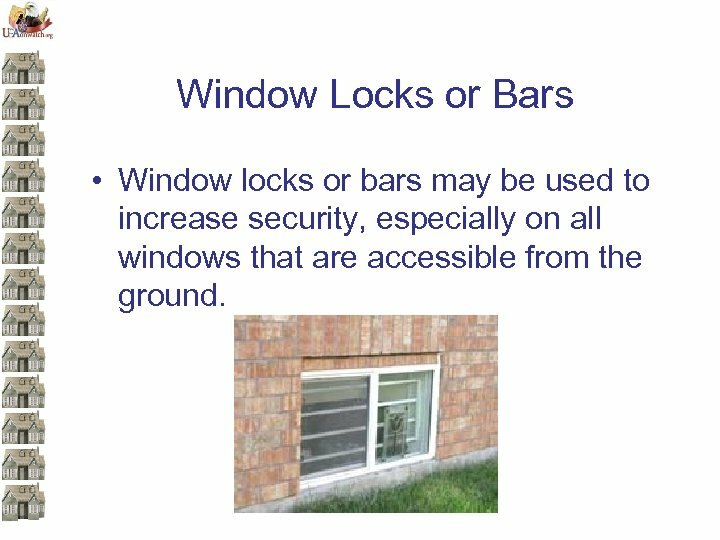 Window Locks or Bars • Window locks or bars may be used to increase security, especially on all windows that are accessible from the ground. 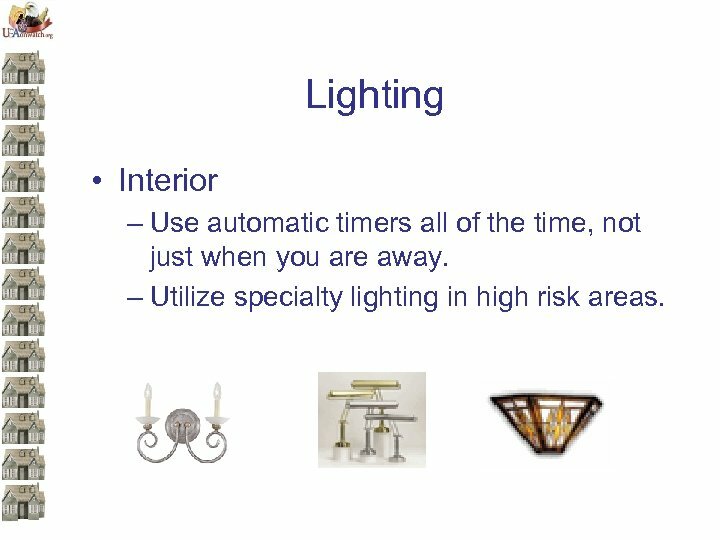 Lighting • Interior – Use automatic timers all of the time, not just when you are away. 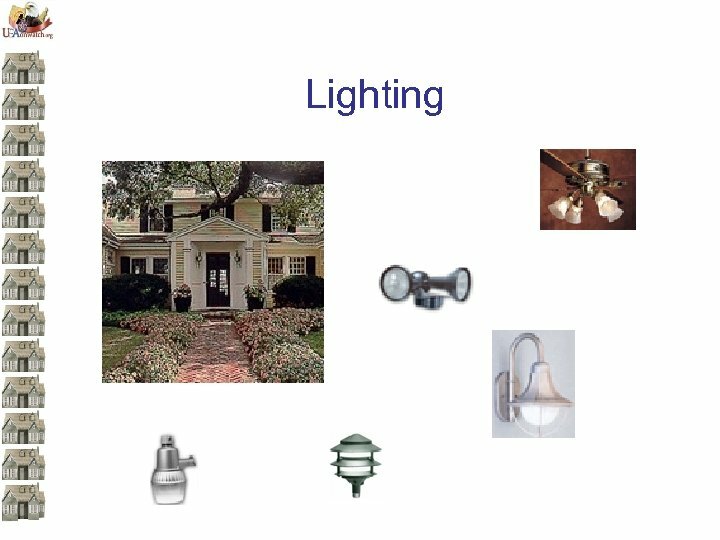 – Utilize specialty lighting in high risk areas. 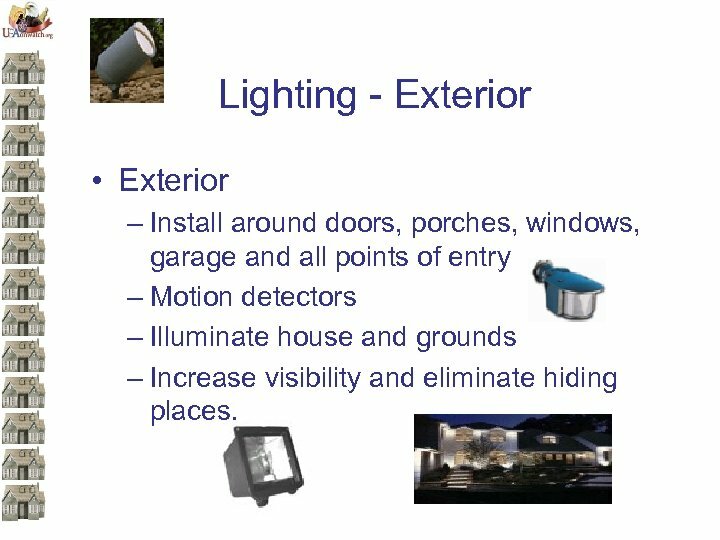 Lighting - Exterior • Exterior – Install around doors, porches, windows, garage and all points of entry – Motion detectors – Illuminate house and grounds – Increase visibility and eliminate hiding places. 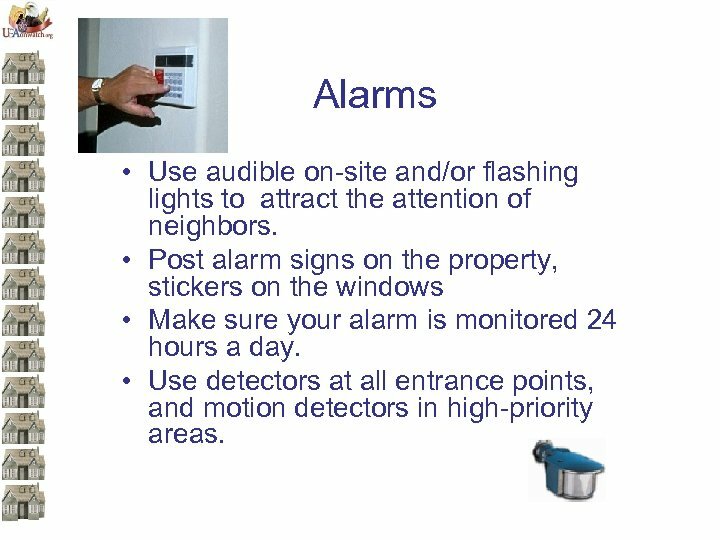 Alarms • Use audible on-site and/or flashing lights to attract the attention of neighbors. 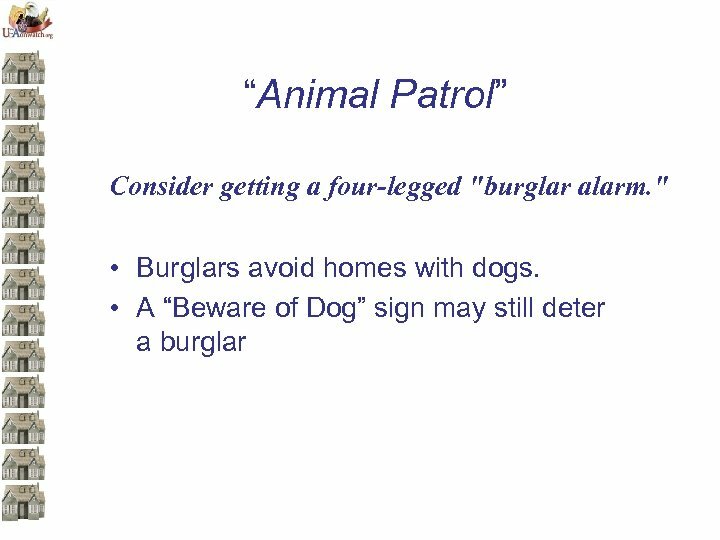 • Post alarm signs on the property, stickers on the windows • Make sure your alarm is monitored 24 hours a day. 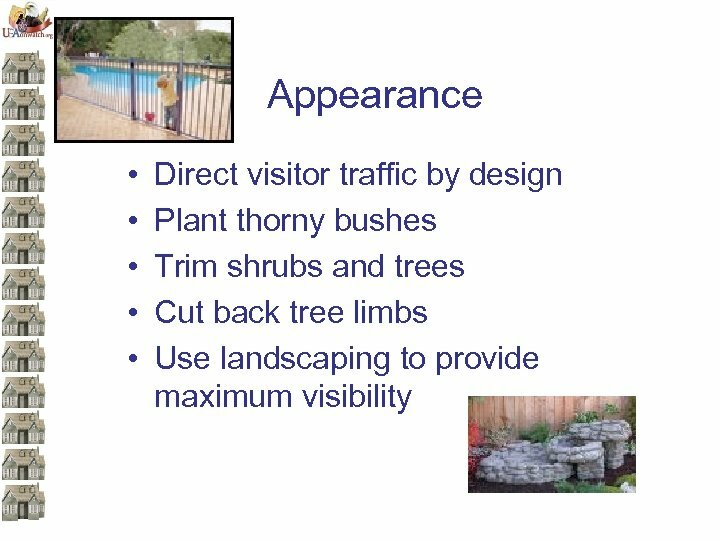 • Use detectors at all entrance points, and motion detectors in high-priority areas. 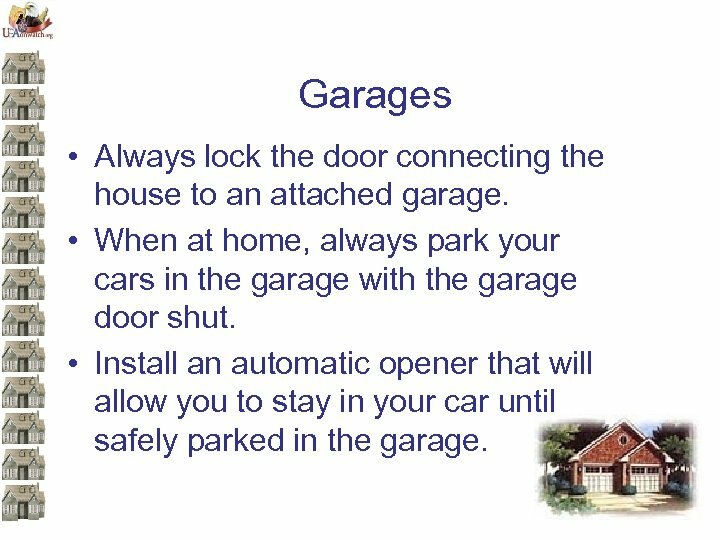 Garages • Always lock the door connecting the house to an attached garage. 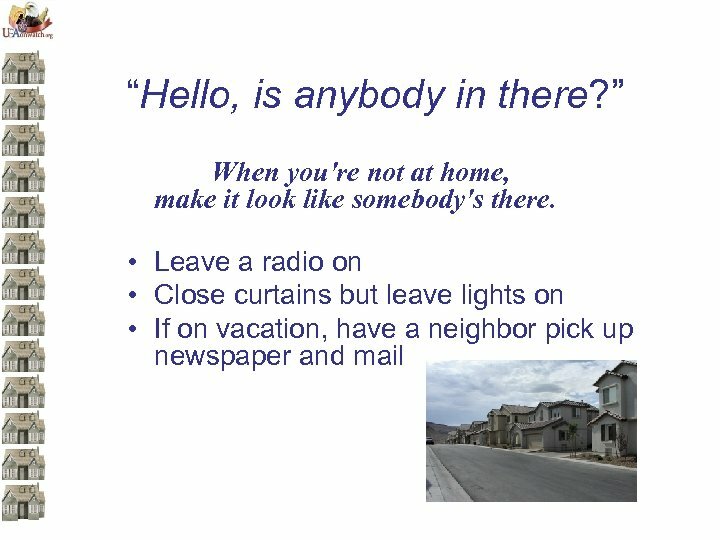 • When at home, always park your cars in the garage with the garage door shut. 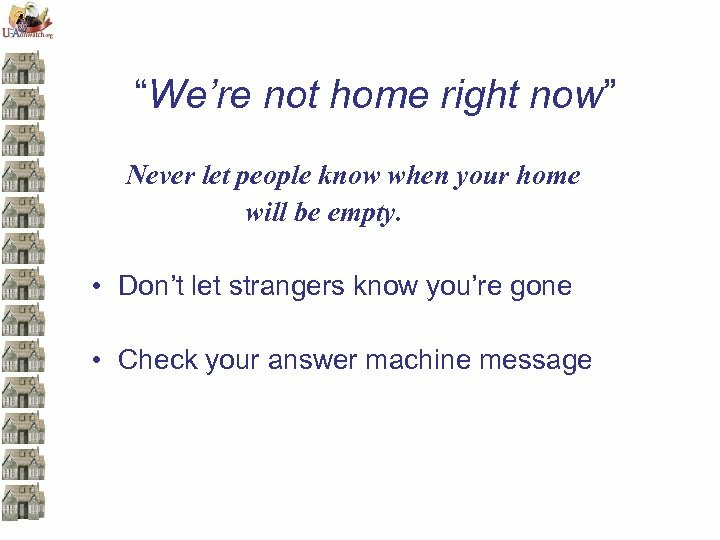 • Install an automatic opener that will allow you to stay in your car until safely parked in the garage. “Hey, look what I got! 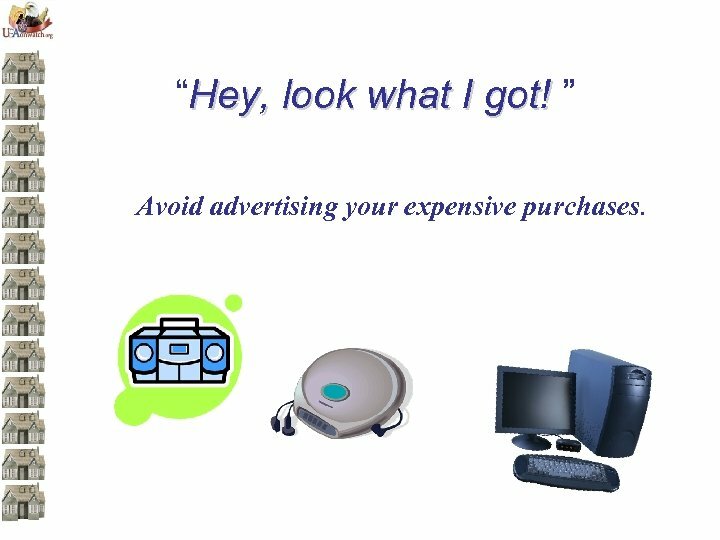 ” Avoid advertising your expensive purchases. 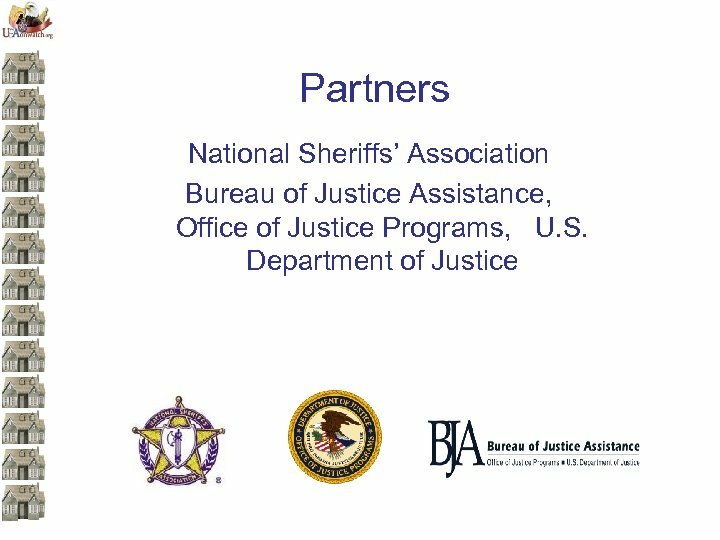 “Tools of the Trade” Lock up your tools and your shed. 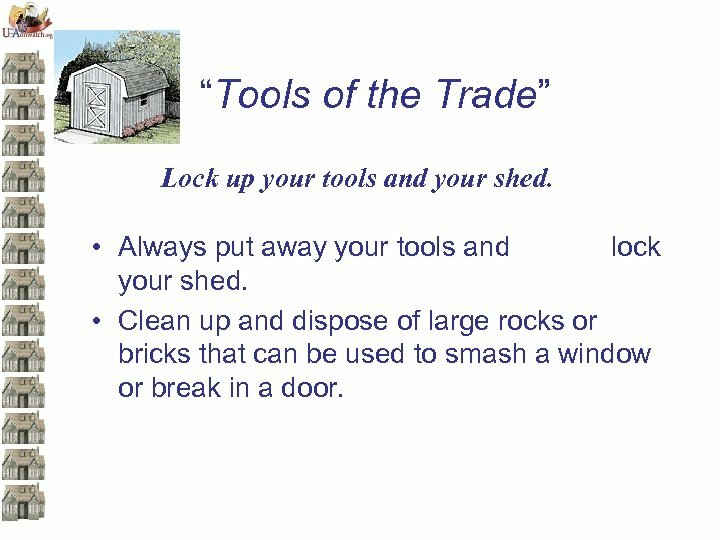 • Always put away your tools and lock your shed. 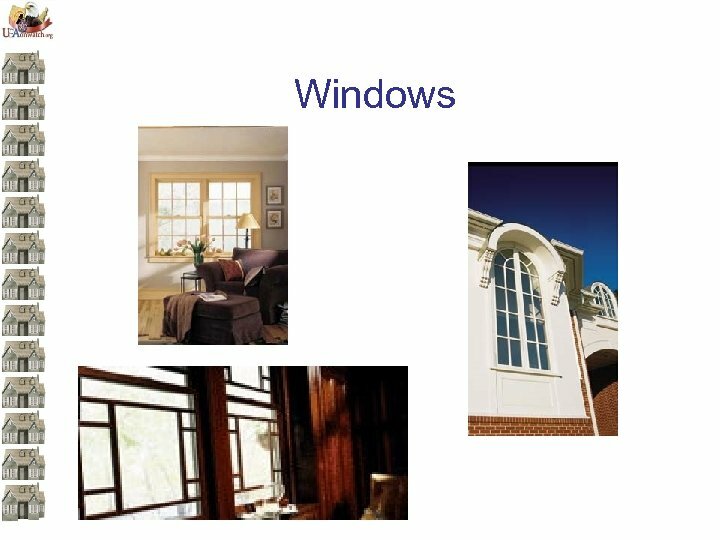 • Clean up and dispose of large rocks or bricks that can be used to smash a window or break in a door.